The Annual Robert Evans Mills Memorial Lecture was presented by Barry Shaw, our Vice President. 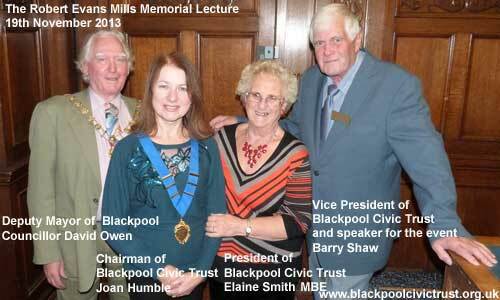 Blackpool Civic Trust held its annual Robert Evans Mills Memorial Lecture in the Blackpool Town Hall on Monday 18th November. Robert Evans Mills was born in Oldham in 1891 and died in Blackpool in 1950 aged 59. He had lectured on archaeology and history at both Manchester and Liverpool universities. He left money in his will to fund an annual lecture to be given in his memory on the theme of the town's development and history. 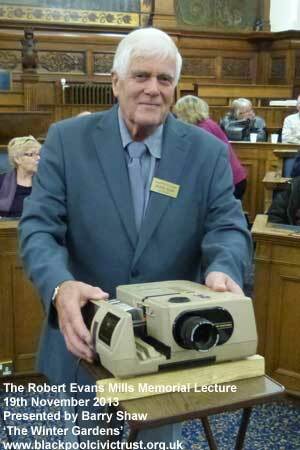 This year's lecture was delivered by local historian, Barry Shaw, to a well attended meeting. Civic Trust Chairman, Joan Humble, said after the meeting: "We are very pleased that Barry Shaw, a past Chairman, past President and current Vice-President, could attend again to give a fascinating and informative illustrated talk on the Winter Gardens. 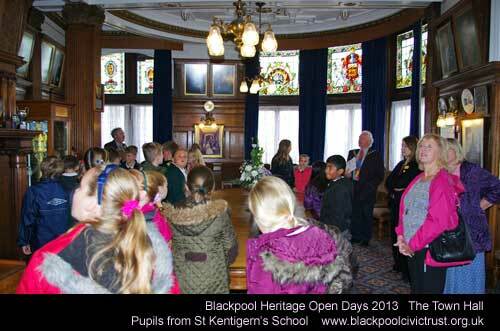 He reminded us of its important role in the development of Blackpool and its continuing importance. I am pleased also that Deputy Mayor Councillor David Owen could attend . 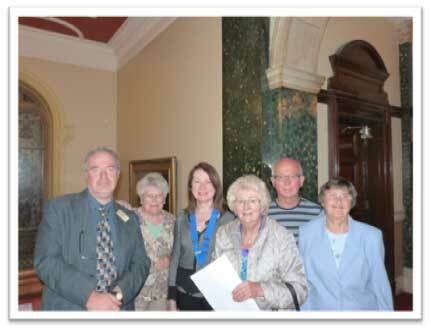 Councillor Owen was a founder member of the Civic Trust and is one of our Vice-Presidents. He thanked Barry Shaw for his lucid and very well-received lecture." David Evans, member of Blackpool Civic Trust and Community Learning Champion, has saved many an old telephone from the scrap heap for his personal collection, which has been more than twenty years in the making. 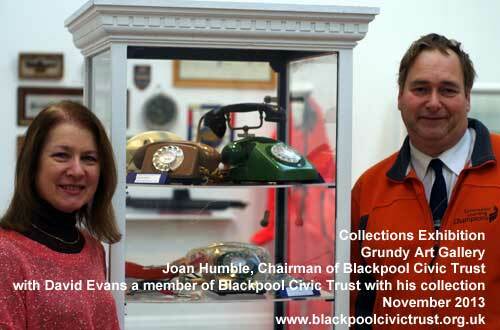 David proudly showed Civic Trust Chairman, Joan Humble, just a small part of his collection of vintage telephones now on display in the Grundy Art Gallery. The Collections exhibition showcases a diverse, fascinating and sometimes downright zany variety of items lovingly collected by residents of Blackpool and the Fylde coast. David Evans told Joan that "I wanted to prevent old phones from disappearing into skips and dustbins. I have found many interesting phones in car boot sales or being thrown out when people get new ones. These phones look better and ring better than modern designs [sound familiar?] and can be converted to be used today." Joan said she was very pleased to see such an interesting collection by an active member of the Civic Trust on display in the Grundy Art Gallery. 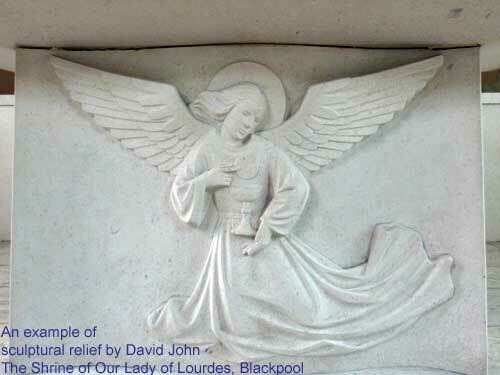 "David has added preserving vintage telephones", she said, "to his role in protecting our heritage here in Blackpool. The whole exhibition is fascinating and David's phones are a colourful and interesting part of it." This major exhibition closes in January 2014. There is a short video on the exhibition, which features David Evans and other collectors, available on Youtube. Nominations are in and we await the announcement of the winners at our annual awards ceremony. Click here to read our reports from previous years and see what to expect, maybe. Every year we have an awards dinner attended by some 200 people from all parts of Blackpool and the UK, including council, business, charities, award winners and members of associated organisations. There are several categories of award and these must meet certain criteria. They are judged by a selected panel and awards will be announced at the dinner, usually in the Winter Gardens, in the new year. Our Chairman, Joan Humble, together with husband Paul, represented the Trust at the Autumn gathering of the North West Association of Civic Trusts and Societies. 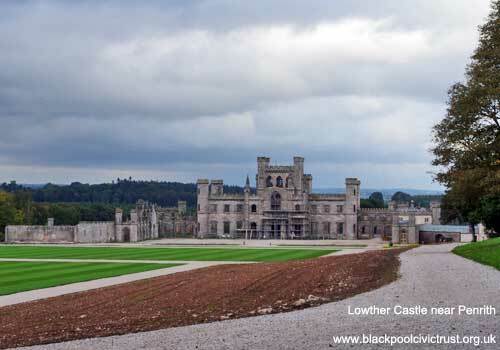 This was held at Lowther Castle and gardens near Penrith on the 12th and 13th of October. Delegates from across the North West learnt of efforts to secure the remains of the Castle, redevelop the Courtyard, and clear the very extensive gardens. The Courtyard now boasts an excellent cafe and shop, while work on conference facilities is well in hand. 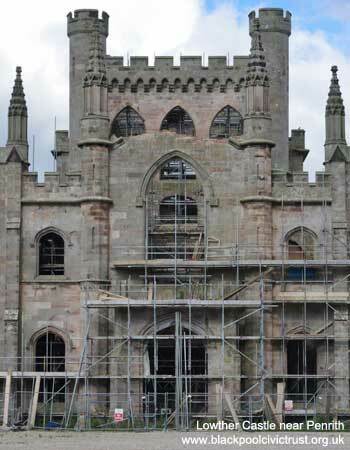 Work is also nearly completed on two galleries, one for paintings and the other for sculpture. Joan thanked the local society guide for a very informative day taking in both the castle ruins and attractive modern developments. 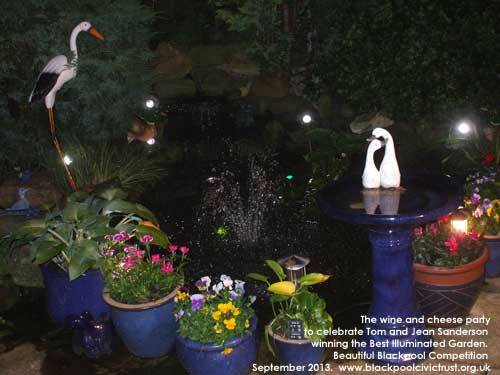 A Wine and Cheese Party was held by Tom and Jean Sanderson after they won the Best Illuminated Garden in the Beautiful Blackpool Competition. 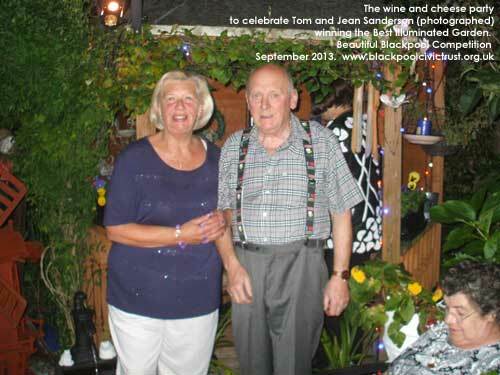 They have won the award 4 years running and this year raised £125 for Blackpool in Bloom by holding a raffle. Brilliant display, well done to Tom and Jean. Report From the Heritage Open Days 2013 Chairman Joan Humble tells us about this years events at the Grundy Art Gallery, the Town Hall, North Shore Methodist Church and more. Blackpool, Fleetwood and Wyre, Lytham St Annes. Thursday September 12th to Sunday September 15th. Click here to find out what is open, when. 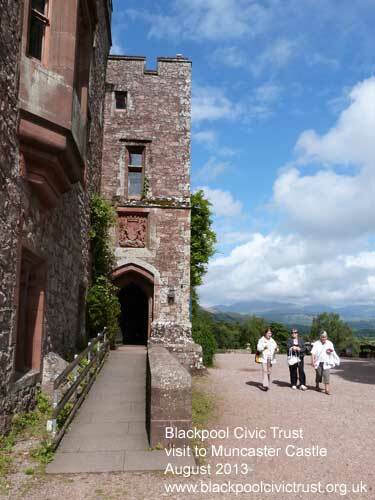 Members and some young guests, visited Muncaster Castle on 16th August as part of our regular programme of visits to places of interest. We enjoyed a scenic tour of the Lake District, with a spectacular view of the castle as we approached from the road. We arrived in time for the opening of the castle, home to the Pennington family since Alan de Penitone was granted the land in 1208. (The original castle was built some fifty years later.) We had time to tour the castle, walk around the extensive terraced grounds with their magnificent views of the distant mountains, and see the large owl sanctuary, as well as witnessing the local herons being fed. Some of us also looked at the 12th century church on the estate. 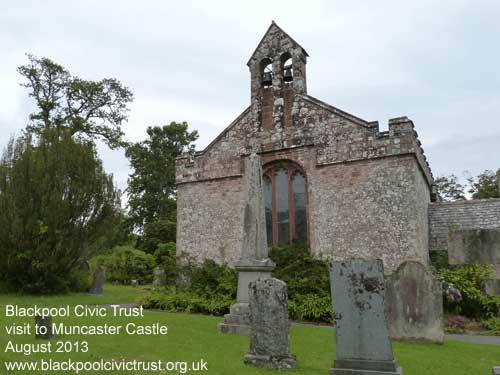 It was a very enjoyable visit to a place of historic interest in a beautiful setting. 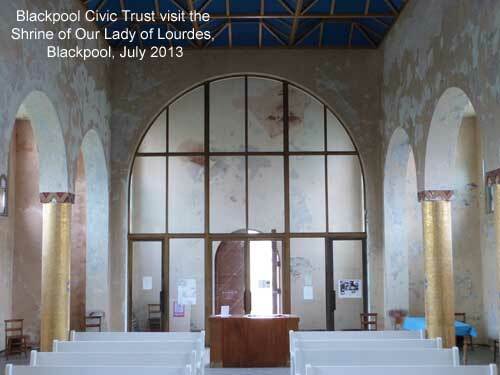 Blackpool Civic Trust have placed 59 blue plaques on buildings in Blackpool. We have recently checked and photographed them all. The photos are on the Blue Plaque page on this website. We will be reviewing their condition and determine whether any need replacing. Click here to view the photographs. 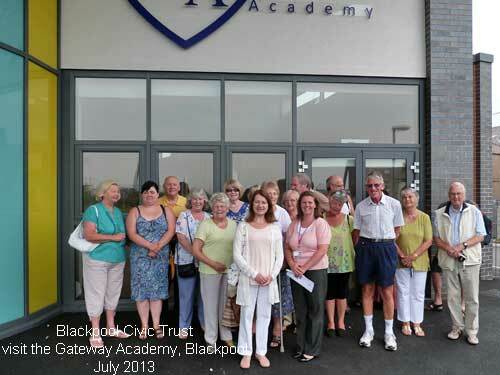 A large group of members visited the newly-built Gateway Academy near Blackpool Football Club, and were impressed by what they saw. We got a good idea of the design of the building, as most of the furniture was not yet in place. 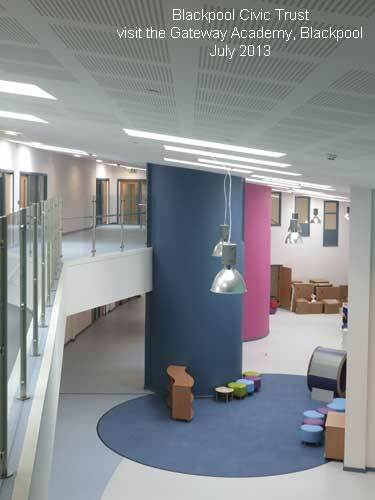 The interior space was very well organised with flowing lines, pleasing colours and careful attention to detail. It should offer exciting opportunities for the young primary-aged children and their teachers. The first intake of children, which will be phased, will be September, 2013. 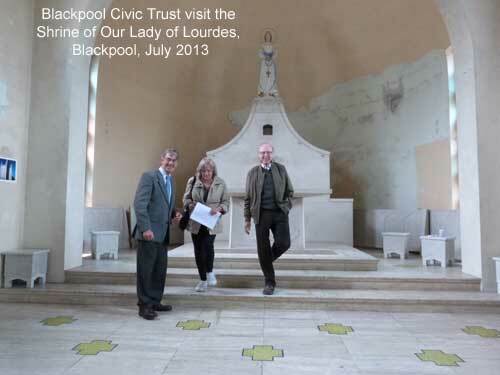 Members visited one of Blackpool's most unusual and memorable listed buildings - The Shrine of our Lady of Lourdes - and were welcomed by David Barston, who is Chairman of the Shrine's committee of volunteers. To call it a shrine is, perhaps, to underestimate its considerable size and imposing proportions. The Shrine was designed by Francis Xavior Velarde, being built in 1957. 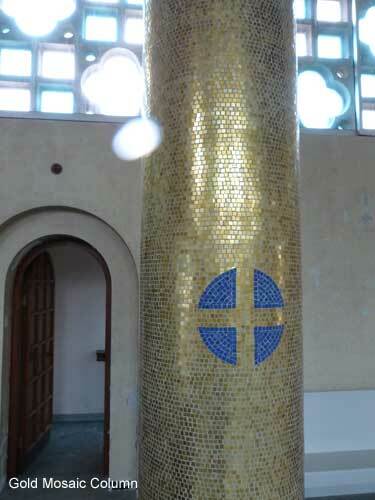 One of our members recalled how she was a regular visitor to the Shrine in earlier days. 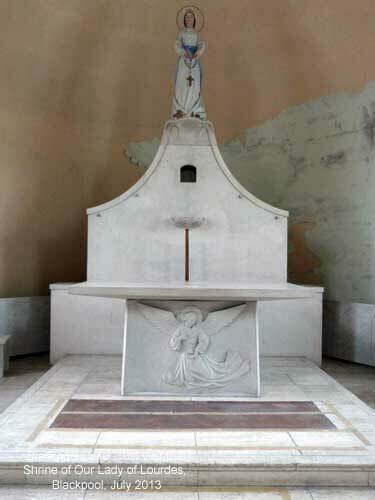 She explained how Irish nurses from the nearby Victoria hospital attended mass at the Shrine, and it is still possible to see the original confession boxes at either side of the Shrine, though it has since been deconsecrated. 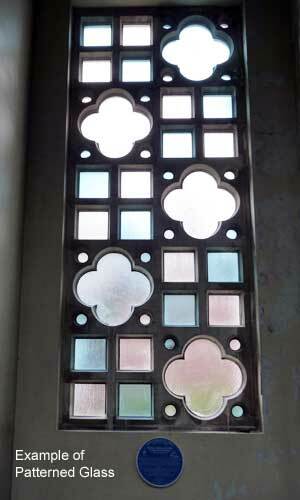 This Grade 2-star listed building has some remarkable internal features (see photographs below). David Barston wishes to see a renovated Shrine serving the local community and being open to the public. Many thanks to him for an informative talk and very lively discussion. 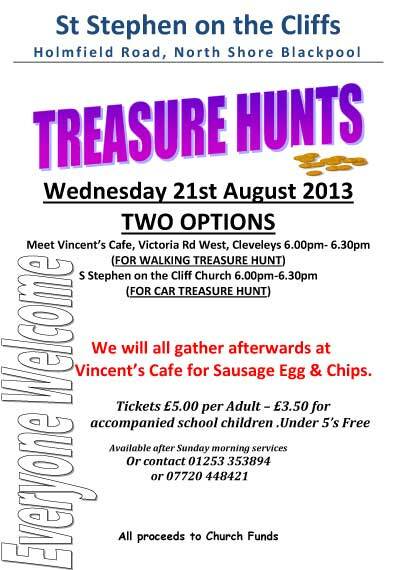 Treasure Hunt in aid of St Stephens on the Cliffs, North Shore, Blackpool. Wednesday 21st August 2013. All welcome. 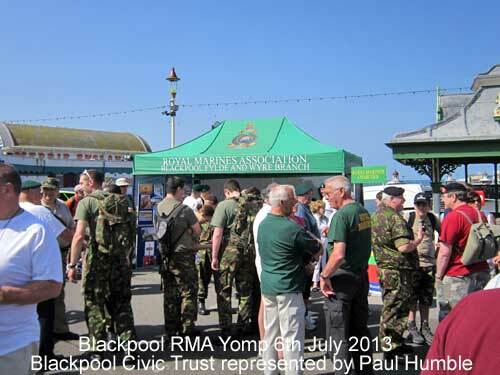 About 200 walkers of all ages and sizes had some fun and raised money for Royal Marine charities on Saturday, 6th July by taking part in a "Yomp". It was a glorious sunny Blackpool day with a sea breeze to keep us cool, as we walked from the North Pier to Jubilee Gardens, Cleveleys and then back again. Thanks to members of the Civic Trust and others for kindly sponsoring me (and my blisters). 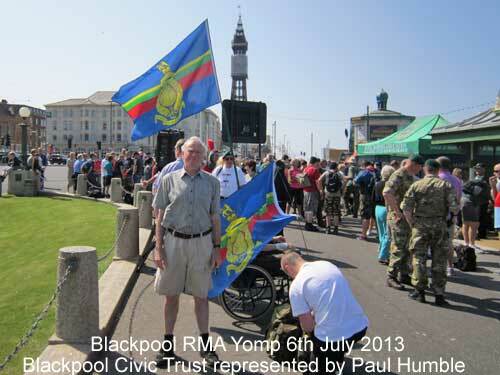 I am already looking forward to next year's Yomp! 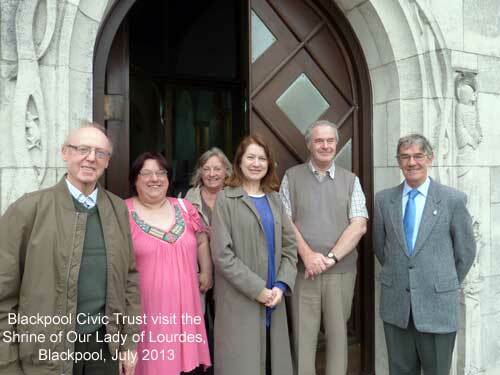 Blackpool Civic Trust one of three selected to speak at the Civic Voice launch day at the Houses of Parliament. 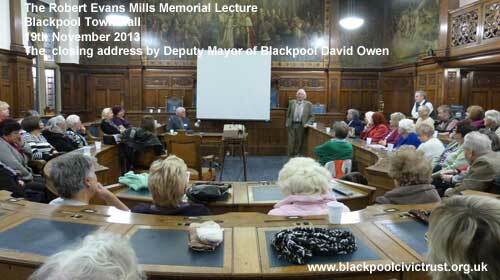 Blackpool Civic Trust meets each month in the Council Chamber of Blackpool Town Hall. Here is a brief run thought what to expect. Before the start of each meeting members and visitors sign an attendance register and can put their names forward for visits to places of interest in Blackpool. The Trust also arranges coach trips to interesting places for which we charge a fee. 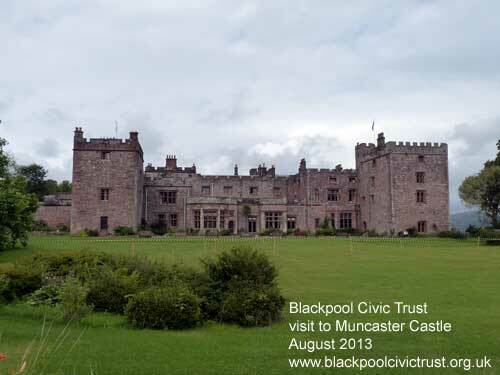 Members are signing up below for a forthcoming trip to Muncaster Castle in August. 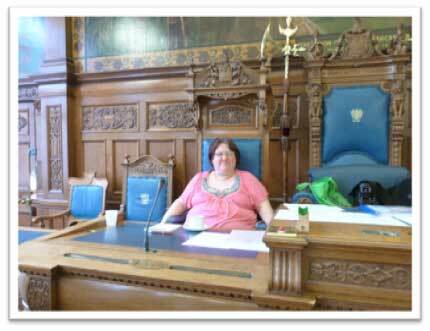 While people are arriving for the meeting our Secretary, Sharon, relaxes in her chair! Meetings begin at 7pm with brief reports by the Chairman and members of the Executive Committee. We hold a raffle and then sit back to listen to our guest speaker. On this occasion Brian Hellewell entertained us in his usual informative and humorous manner, talking about “Great Speakers Through the Ages”. Our meetings end by 9pm. 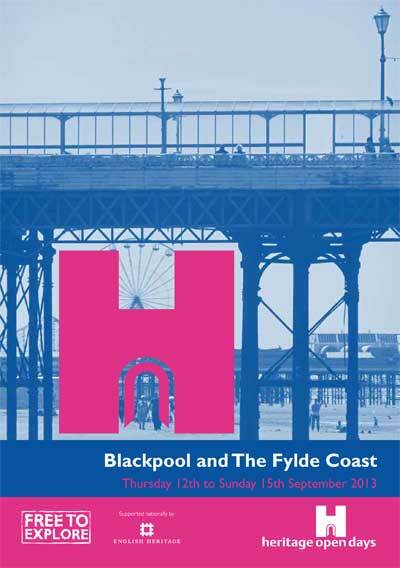 The next meeting is on 15th July and Carl Carrington, the Built Heritage Officer for Blackpool Council and a heritage specialist, will speak about “Blackpool's Built Heritage 2006-13. 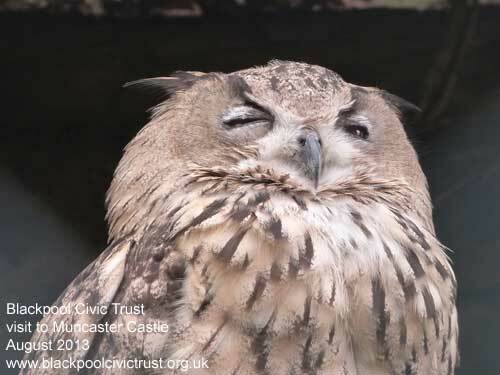 Since this was a period of great change in Blackpool Carl's talk is of particular interest, and visitors are welcome to attend the meeting, starting at 7pm in the Council Chamber of the Town Hall, as usual. Download a copy of the above report. 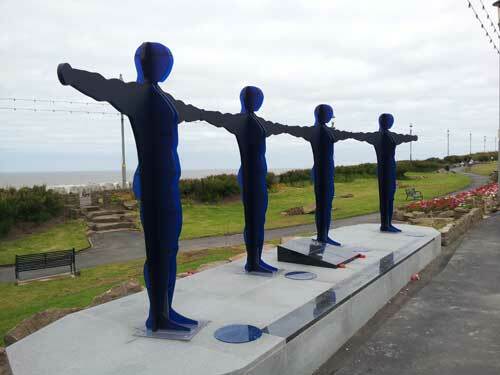 Blackpool’s new statue honouring the Emergency Services. On 27th June 2013 a memorial and appreciation of the Emergency Services was unveiled in Jubilee Gardens, Gynn Square. It is 30 years, 5th January 1983, since three constables of Blackpool Police Force lost their lives in an attempt to make a sea rescue at this point. PC Colin Morrison, WPC Angela Bradley, PC Gordon Connolly are commemorated on a plaque at the garden entrance but now this memorial will stand for their bravery and that of the four Emergency Services: Ambulance, Coastguard, Fire Brigade and Police Force. The statue has been created through fundraising by local resident Dana Gledhill and designed by local student Matt Titherington showing what can be done by local initiative. Civic Day is a national celebration of civic pride. It is a day when communities across the country say "we care about where we live". In Blackpool we have turned this into a whole week. Saturday 22nd June is England’s third ever Civic Day and over 150 civic societies across England will be holding events to celebrate their area and keep it distinctive. 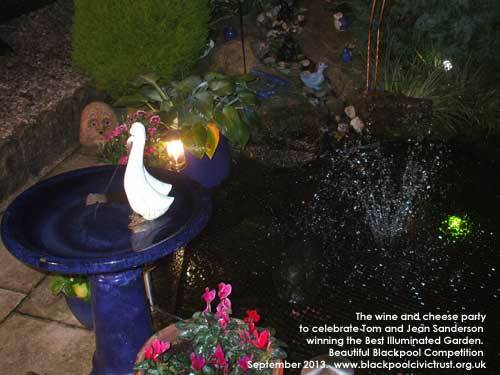 Blackpool Civic Trust will be holding an Indoor Street Party in the Winter Gardens Olympia. The Indoor Street Party will be opened by Gordon Marsden MP at 11am, and the Mayor of Blackpool, Cllr. Eddie Collett will be presenting an award for the Best Kept Street and prizes for the winners of the Scarecrow Festival held last weekend. We will have all sorts of entertainment and stalls including Face Painting for only £1, RNLI, Friends of Stanley Park, Little Creations, Blackpool Carers, Orchids Mobile Beauty Therapy, Lancashire Fire & Rescue plus many other stalls as well as tombolas. Free sweets will be given out while stocks last. On June 10th 2013 it was announced that the trams kept in storage by Lancastrian Transport Trust(LTT) are to be combined with the Blackpool Transport Heritage Fleet. A new charitable trust will be established to oversee the trams which will be operated by Blackpool Transport on the Heritage Services. This is regarded as some of the best news on the Blackpool tram scene for a long time. Below is a photograph of the 80 year old LTT tram 715 which Blackpool Civic Trust purchased a share in to help preserve it in 2011. 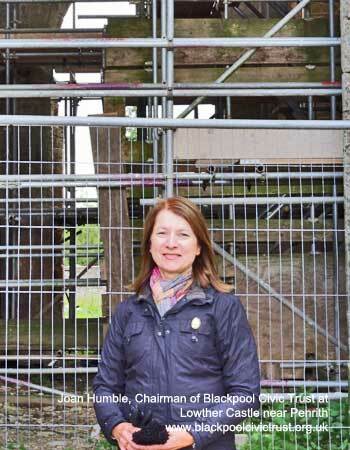 Our first newsletter from our new Chairman: Joan Humble. Sharon Sanderson-Roberts is the new Secretary and Jean Sanderson our new Publicity Officer. Jean Brookhouse is our new Treasurer, Chris Norton is Corporate Members Officer. Bob Taziker will be looking at the local listing and be aware of the possibility of neighbourhood plans. 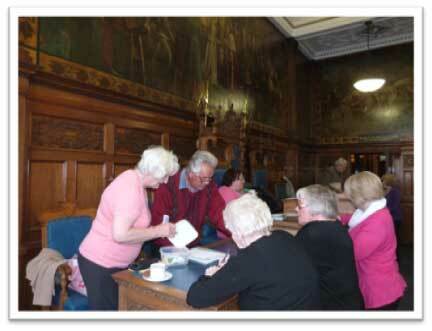 We were represented at the AGM of the NW Association of Civic Trust and Societies which was held at Preston. We are working to plan a full range of events for Civic Week beginning with the Scarecrow Festival 14 to 16th June, a Heritage Bus Tour on Tues 18th June, Quiz Night on Wed 19th June, trip to Fleetwood on Thursday 20th June. Civic Day will be held in the Winter Gardens on Saturday 22nd June and the week's events will finish with Totally Transport on Sunday 23rd June. 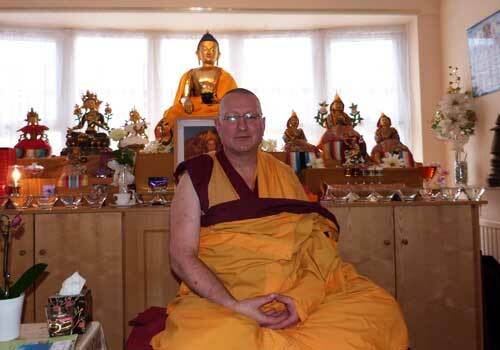 A local visit was arranged to the Buddhist Meditation Centre on Friday 19th April and we heard a very interesting presentation by the resident teacher, Kelsang Wangchuk. We have begun early bookings for the Veterans Dinner at the Norbreck Castle on 28th June. 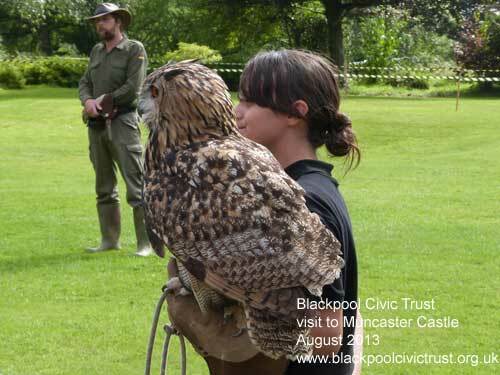 Betty is also taking bookings for visits to Muncaster Castle on 16th August and York on 20th September. Volunteers are required to help run the car park the zoo has kindly offered us for the Scarecrow Festival. 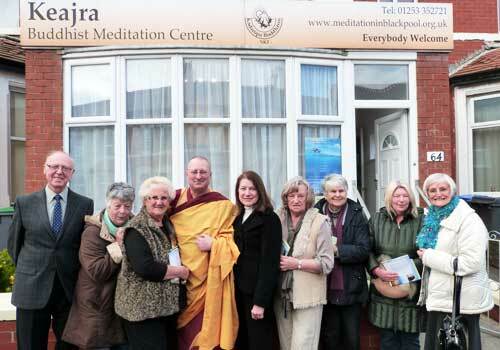 On 19th April, 2013 a group of Civic Trust members visited the Keajra Buddhist Centre. We met the Resident Teacher, Kelsang Wangchuk, who explained to us aspects of Buddhist belief and the practice of meditation. He also explained in fascinating detail the significance of the various figures on the shrine, and answered a variety of questions from our members. An unusual and highly successful visit! Saturday 25th May to Monday 27th May. Heritage Trams run from the special green circle stops on the prom on Public Holiday dates. 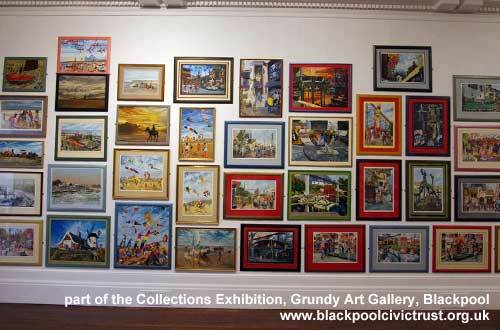 These are located at the Pleasure Beach (tram loop), North Pier (Tower Side), Uncle Tom's Cabin, Bispham. 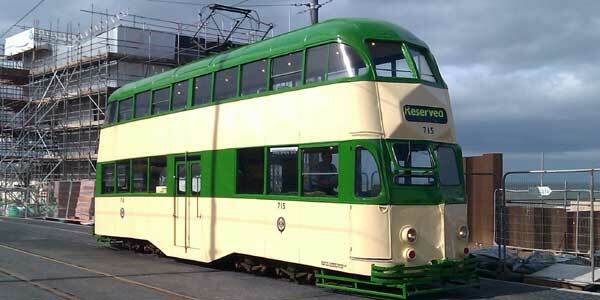 The trams also go to Fleetwood Ferry. In 2013 some services will run from the Pleasure Beach to Fleetwood. Most will run from the Pleasure Beach to Bispham with a mini ticket available between the Pleasure Beach and North Pier. 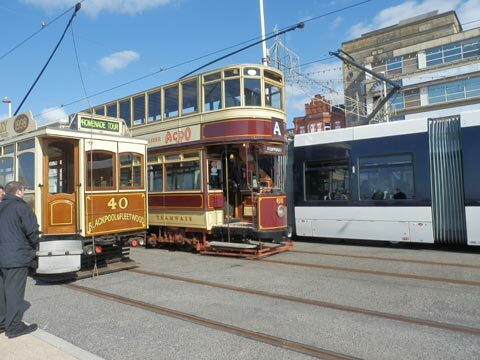 Three Blackpool Trams, the old and the new. The full report of our awards ceremony is now on the website. The event was a great success and we thank all who attended and congratulate the award winners and nominees. Click here to read the full report. “It has a lot more history than the ABC building which people are currently fighting for and a lot more going for it too. Showzam is a captivating festival for all, which is truly unique to Blackpool. Bringing together the skills, talents and theatrical expertise of world famous performers from circus, magic and new variety Showzam '13 is packed full of enticing entertainment, sensational new shows, wonderful wizarding workshops and much, much more! After much thought and discussion, the Executive Committee of the Blackpool Civic Trust has decided that it is unable as a group to support the campaign to save the former ABC/Hippodrome/Empire building. The decision is based on three factors. Firstly, whilst we recognise the historical significance of the venue, we would point out that our members watched the building stripped of virtually every visible, physical feature of heritage value when it was converted to the Syndicate nightclub. This was done over the objections of the Civic Trust who made many of the same points that campaigners are now making at a time when there was still something physical to save. 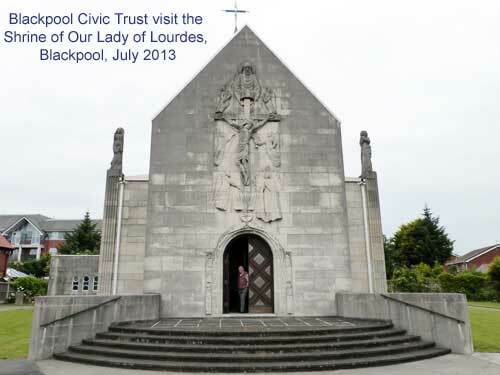 Secondly, Blackpool Civic Trust must focus its energies and efforts on trying to save buildings that have retained heritage character and can be moved into new uses that retain their historical and architectural significance. The former ABC has been too far compromised to fall into these categories. We know other buildings of a similar nature - the former Regent Cinema on the corner of Church Street and Regent Road is a good example - are at risk, with owners in receivership, buildings vacant and serious condition issues. Thirdly, the idea of creating a museum and performance space within the shell of the building is laudable in itself, but could well compromise the future of buildings like the Winter Gardens (with a huge amount of space for performance and/or conversion to museum use) or the potential for use of buildings like the old Post Office on Abingdon Street for similar conversion. In essence, it would draw funding and energy away from buildings with more physical value and longer histories, a policy that could have far reaching consequences into the future. We would conclude by saying that as a group we feel that the loss of the former ABC/Hippodrome/Empire is unfortunate and that we recognise the history of the building as a performance venue, but that we are unable to justify supporting a campaign that could end up having a wider negative impact on other buildings at risk in Blackpool. Daily January 11th to January 27th 2013 10am to 2pm and then weekends till Easter. For some time now we have felt that the Visitor Centre at the park has been under used. We have now got together with Carl Carrington, the Built Heritage manager for Blackpool Council, and a number of heritage displays will be exhibited over the next 12 months. This first exhibition is about 100 year of the Illuminations and has pictures and artefacts. This will be there for two months and then we will be having exhibitions about the Winter Gardens, the Comrades Club, Blackpool’s Lost Buildings, Landscape Masterpiece (The history of Stanley Park/Book Launch) and The Loos and Arras Trenches at Watson Road Park – though not necessarily in that order! Normally the Visitor Centre is only open at the weekends at this time of year until Easter. However we are going to open every day from this Friday – 11th – until Sunday 27th January from 10.00am until 2.00pm because along with the exhibition we will be doing a public consultation about a new playground that we are hoping to have built at the park. The Adventure playground has been so successful that we now need a new one for the under 8 yr olds. After the fortnight of consultation we will go back to weekends only until Easter. BBC1. Thursday January 3rd 2013, 10.35pm. 'Like many seaside resorts, Blackpool has been through hard times but it remains Britain's number one holiday destination. This film goes behind the scenes with the people working hard to keep Blackpool ahead of the game through one of the wettest summers on record.